Dr. Joe Whalen graduated with honors from the University of Illinois, College of Veterinary Medicine in 1991. Dr. Whalen has been the owner of LePar Animal Hospital since 1995. He began his studies in Animal Chiropractic in 2000 and completed his acupuncture training at the Chi Institute in 2003. Dr. Whalen is certified in Veterinary Chiropractic by the American Veterinary Chiropractic Association and is an instructor in Veterinary Chiropractic at the Healing Oasis Wellness Center. In his free time Dr. Whalen enjoys spending time with his family and friends, playing basketball, fishing and working out. 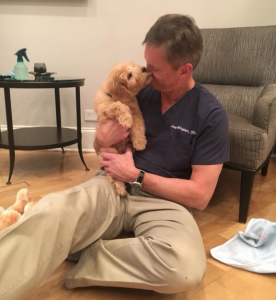 Dr. Whalen and his wife Lisa are the proud new parents of puppy Sacha. They welcomed him into their family February of 2018! Mary graduated with honors as a Certified Veterinary Technician and earned her certification as a Canine Rehabilitation Practitioner from the University of Tennessee. She is also certified in canine massage and is a Reiki III Master. She shares her home with two Boston Terriers, Buster and Gracie; a Pug/Pomeranian mix, Hughie; and Crosby the cat. “My journey began with the intense desire for my “fur babies” to thrive, not to just survive. Each and every one of them has been a learning experience and they are responsible for my desire to help other people and their “fur babies” I dedicate this to all of them, especially the ones that have gone to the rainbow bridge – Joab, Casey, Maggie, Kitty, Murphy, Elmer, Vivian, Bailey and Nellie. Hello, My name is Kady and I have been a Veterinary Technician at LePar since March 2014. I graduated from The Vet Tech Institute at Fox College with an Associates Degree in Veterinary Technology. I love animals and have worked with them for 10 years. I have my own zoo at home which includes dogs, cat, rats, a guinea pig, a hamster, and fish!